International concert performer, Laurence Kayaleh is an artist of deep musical insight, possessing a rich, singing tone and a natural feeling for style. Possessing the impeccable technique and innate musicality of the grand tradition of violin playing, while at the same time venturing regularly into contemporary music, her playing comprises all the facets of a complete musician and creates an intensely moving experience for the public. Ms. Kayaleh’s early career took her to prestigious music centers in the world : Paris, Prague, Brussels, Zurich, Sofia, Bern, Moscow, Modena and Geneva, where she was soloist with such well-known orchestras as Zurich’s Tonhalle Orchestra, Geneva’s Orchestre de la Suisse Romande, the RTBF Symphony Orchestra (Belgium) and the Basel Symphony Orchestra, performing the Saint-Saëns Violin Concerto in B minor. 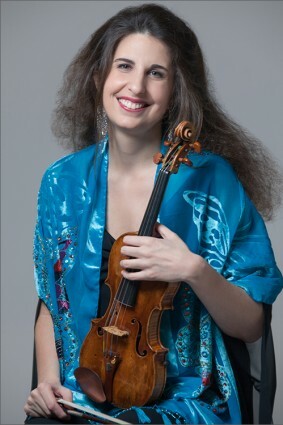 Having accomplished her artistic training in the Stage Performance Classes of the prestigious Kayaleh Violin Academy in Switzerland (Performer Diploma), she won First Prize with distinction at the Swiss Competition for Young Soloists, and was awarded the Grand Prize by unanimous decision of the Jury at the Stresa International Competition, Italy. At her Paris debut at the Théâtre du Châtelet, the world-renowned critic of Le Figaro, Pierre Petit, described her playing as regal, praising her wonderful sound and her innate sense of phrasing. Following this event, she performed at the Gaveau Hall in Paris, has been a guest of the Lucerne Festival, and played as soloist under such well-known conductors as Pavel Kogan, John Carewe and Hiroshi Wakazugi. Laurence Kayaleh performed as soloist at the Bolchoï Hall and at the Tchaïkovsky Hall in Moscow, performing the Brahms Violin Concerto with the Russian National Orchestra under Mikhaïl Pletnev, at the Pleyel Hall in Paris with the Lamoureux Symphony Orchestra under Grzegorz Nowak sharing the concert with violinist Igor Oïstrakh, at the Lied Center in Lincoln, USA, at the Tsu Center for the Performing Arts (Japan), and at the Suntory Hall in Tokyo. Her American career rewarded her with standing ovations wherever she performed : at the Blossom Festival with the Cleveland Symphony Orchestra, at the John F. Kennedy Center for the Performing Arts with Washington’s National Symphony Orchestra under Leonard Slatkin who described her as a unique musician, and at the Powell Hall with the St. Louis Symphony Orchestra. Other engagements featured Laurence Kayaleh as soloist performing the Tchaïkovsky Violin Concerto with the Simon Bolivar Symphony Orchestra in Caracas, Venezuela, with the Montreal Symphony Orchestra under Charles Dutoit and with the Basel Symphony Orchestra under Mario Venzago in Prokofiev’s Violin Concerto No. 2 in G minor. Her Milano debut was marked by a brilliant recital given at the Verdi Hall. She performed in the USA, in Toronto, Canada, as soloist with the Orchestra Stabile di Bergamo at the Donizetti Theater in Bergamo, Italy, with the Mexico City Philharmonic at the Cervantino International Music festival in Guanajuato and in Mexico City playing Beethoven’s Violin Concerto, for Radio-Canada, as well as concerts throughout Canada, in Dublin, Ireland, and at the Tonhalle in Zurich. Other engagements include 20th-century chamber music concerts at Montreal’s Canadian Center for Architecture, recitals in Messina, Sicily, recordings for the CBC-Series (Canada), and for the Swiss, French, Belgium and Russian radios/televisions, concerts in the Ottawa International Chamber Music Festival and a Gala Concert in Switzerland that she shared with violinists Viktor Pikayzen and Ida Haendel. 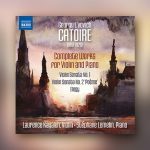 Laurence has recorded for NAXOS the complete works for violin and piano by N. Medtner (8.570298-99), A. Honegger (8.572192), and G. Catoire (July 2016 release – 8.573345). Upcoming events will take place in Canada and in Europe. Ms. Kayaleh is also invited to be a member of jury in Canadian and international music competitions and she is regularly invited to give Masterclasses in Canadian universities and in institutions in South America and in Europe, including festivals. In 1996, Laurence was granted the Nyon City Artistic Award, Switzerland. Laurence Kayaleh’s repertoire covers the works written for the violin. She performs on a magnificent Pietro Guarneri built by the Venetian master in 1742, which belonged to the eminent violinist and pedagogue, Carl Flesch. With her lovely bearing and commanding stage presence, Laurence’s violin speaks to the audience in an extremely personal and unforgettable way.